Native Americans and Alaska Natives have some of the worst health outcomes of any group in the country. According to the Centers for Disease Control and Prevention, Native Americans are more likely to rate their health as "fair" or "poor” than most other groups. Rising rates of diabetes and obesity have been covered extensively by a variety of local and national media outlets in recent years, with rare glimpses of hope or success included in those stories. For our reporting project, “Re-connecting with a Healthy Lifestyle,” we intentionally pursued a different approach in covering these issues. Both of us have extensive experience reporting on Indian Country and knew there were untold stories about programs and initiatives that are working and could provide new insights into efforts to address health outcomes in Native communities in the Southwest. Without ignoring the troubling statistics on health, we focused our reporting on examining the opportunities and challenges in potential solutions. We researched tribal programs, federal efforts and grassroots initiatives undertaken by individuals who are sharing what's working for them through word of mouth and online platforms like Facebook. We believed we could reach a broader audience of both Native and non-Native communities by working together to produce radio and television stories. We drew on the framework offered by the Center for Collaborative Media’s six models of collaborative journalism. For our fellowship project, we planned regular editorial calls and shared documents to organize research and potential sources. We divided up the work, from examining CDC reports to booking interviews. 1. 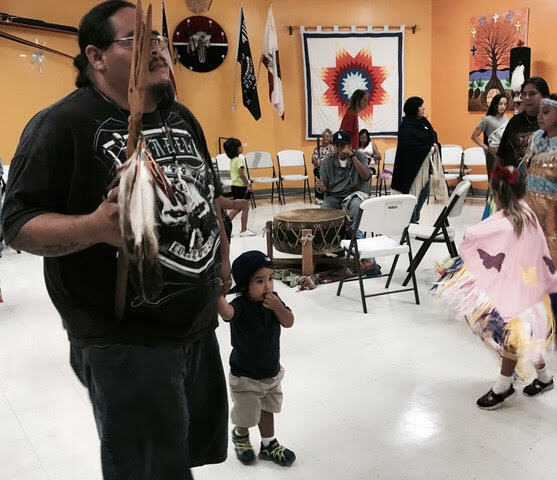 Reporting on health in Indian Country means confronting past wrongs. One of the first challenges in reporting on this issue was the lack of hard data on Native American health outcomes. General trends are available from the Centers for Disease Control and Prevention, but because Native Americans make up such a small part of the population, data is often old or incomplete. More importantly, there is a history of researchers improperly informing Native people about data collection. We have both found, in this project and in our past reporting, that many leaders in Native communities are hesitant to talk to journalists because of negative experiences in the past. We dedicated significant time, including in-person meetings and phone calls, to answering questions and talking about our project. Talking about past reporting on health issues in Native communities became an important part of our reporting process, and what we learned from those conversations will continue to inform our work in the future. 2. Building trust with partners is just as important as building trust with sources. Our project benefited from the trust we formed while working together at the Koahnic Broadcast Corporation, when Sarah was executive producer of national programs. We believe it is possible to build relationships between media outlets, particularly with ethnic media. A good place to start is to follow the coverage of reporters in ethnic media and share their work before seeking out a collaboration with them. Reporting on tribes and Native American communities in the mainstream media is often lacking and sensationalized. Our fellowship project demonstrates the incredible opportunity in partnering with Native media organizations and Native journalists to pursue more insightful coverage of Native communities. 3. Telling a story in multiple formats is also challenging. One misconception about our project might be that we produced completely different stories for each outlet and their different audiences. We did not. National Native News (NNN) runs on 130 tribal and public radio stations across the country. Although NNN has both Native and non-Native listeners, coverage is always approached from an indigenous perspective. That means not everything needs to be explained in the detail that might be required for a non-Native audience. For example, NNN would still say “Indian Health Service” but wouldn’t explain in a story that IHS is a treaty obligation. New Mexico PBS serves many Native American communities and could assume a certain level of knowledge about Native issues, but required some additional explanation in the television packages. It’s a fine line that we debated internally. Our goal was always to convey that the stories weren’t just looking in on Native life but were also for Native people. By approaching this project with the same set of values and background knowledge, we only needed limited language to inform non-Native listeners and viewers about potentially unfamiliar concepts. This helped us ensure that both radio and television stories were by and for Native and non-Native people and did not fall into the trap we have observed where stories seem to be looking in from the outside and the Native audience is ignored. The geographic area that we covered, from New Mexico to Southern California, provided many opportunities for new insights in our coverage but it was expensive and challenging to coordinate interviews in multiple cities. Future regional projects might benefit from closer collaboration with reporters in different communities. If starting a new project, it might be best to start with one shared story. But partnering on a project also opens up opportunities to share your work widely online. Beyond the broadcast, producing content for two different news organizations allowed us to reach even more people through Facebook, Twitter, our websites and newsletters. Include and explore both traditional and Western medicines while covering ways tribes and individuals are approaching food, health and wellness. Ask sources how they define their health goals or measures of success. Include a range of resources and perspectives, such as a health professional, tribal leader and grassroots coalition member. Consider the unique challenges in both urban and reservation communities. There are more than 500 tribes across the country — don’t expect the story to be the same in every community. Lean about tribal sovereignty and treaty rights, and how both of those influence access to health care.